EVA Air, Taiwan’s leading independent carrier, has taken delivery of its first 787-9 Dreamliner aircraft. 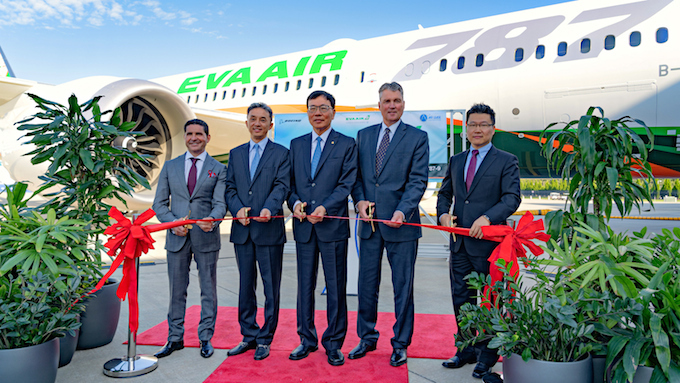 The delivery took place at Boeing South Carolina earlier this month, when EVA’s chairman, Steve Lin, led a delegation to welcome the new aircraft, commemorating the event with a ribbon-cutting ceremony. The aircraft will be flown to Taiwan and prepared for service. On 1 October 2018, Kevin McAllister, president and CEO of Boeing Commercial Airplanes, hosted a ceremonial dinner where ceremonial certificates were signed by Lin and ALC executive chairman Steve Hazy, owner of the new Dreamliner that EVA will be leasing. These certificates signify a new milestone in the partnership between the three parties. Lin said: “Our introduction of Boeing 787 Dreamliners gives us a younger and more efficient fleet and further upgrades our service quality. In addition to giving our passengers the comforts and conveniences of the Boeing Dreamliner’s advanced aviation technologies, we have made great efforts to enhance our cabin service. “We will launch new Royal Laurel Class business seats created by Designworks, a BMW company. And we chose Teague, a global design consultancy recognised for work in aviation, to design new Economy Class seats that RECARO, a German manufacturer known for sports car interiors, is producing. EVA is set to add 24 Dreamliners to its fleet, including four 787-9s and 20 787-10s, between the second quarter of 2019 and 2022. The Being 787-9 has a range of 7,100 nautical miles fully loaded and the capacity to fly from Taipei to Vancouver, Seattle, Vienna or Brisbane. The 787-9s will be configured for 304 passengers with 26 in Royal Laurel Class and 278 in Economy. Highlighting its status as the first Boeing 787 to be introduced into service in Taiwan, EVA’s new Dreamliner is distinguished by the addition of the innovative aircraft model’s logo to the livery design. The livery also incorporates powerful green and orange stripes, representing Evergreen Group’s corporate identity colours. Technologies used to build the Boeing 787 Dreamliner make the aircraft more environmentally efficient. It is constructed of lighter composite materials such as carbon fibre and more than 50% of the aircraft’s total weight comes from these materials, including the fuselage, wings and engine blades. Compared to traditional aluminium alloy fuselage construction, these advanced materials significantly decrease the aircraft’s overall weight and likelihood of metal fatigue or corrosion, reducing maintenance costs. Replacing fluorescent tubes with LED lights shrinks power demand by almost half. GE’s advanced GEnx engines reduce fuel consumption and greenhouse gas emissions by 20%, compared to power systems on traditional wide-body aircraft. The 787-9’s high fuel efficiencies and range capabilities equip EVA to further enhance operational performances. Boeing also engineered its Dreamliners to enhance cabin comfort. The Boeing 787 is equipped with an advanced air filtration system that improves cabin air, and the fuselage is made of a combination of composite materials that make it more airtight. Compared with other commercial jets, the 787’s cabin humidity can be increased as much as three-to-four times, eliminating the drying inflight atmosphere. The aircraft’s cabin pressure can also be controlled to make the altitude feel like the optimal 6,000 ft. instead of the standard 8,000 ft., boosting passengers’ blood-oxygen levels and reducing headaches and fatigue. Newly designed engine housings significantly reduce noise and give passengers quieter, more comfortable inflight environments. 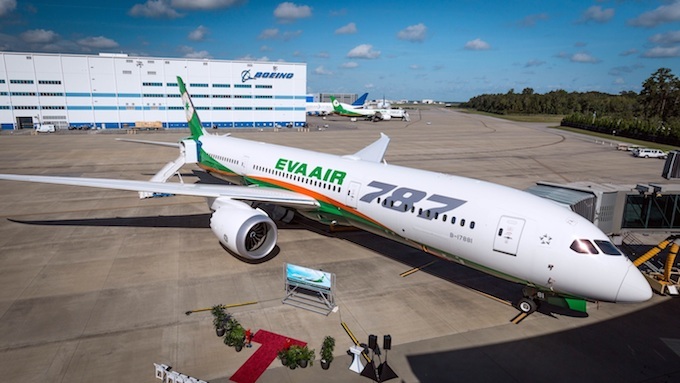 As soon as EVA gets its first Boeing 787-9, it will finalise preparations for putting the plane in service and work with Taiwan’s Civil Aeronautics Administration (CAA) to get it certified. EVA estimates that it will launch the new Dreamliner in early November 2018. It will initially deploy the aircraft on its busy Taipei–Hong Kong route. EVA’s second Dreamliner is expected to be delivered in November 2018 and will be used to extend the airplane’s operations to Osaka and Tokyo. The remaining two Boeing 787-9s are scheduled for delivery in 2019 and EVA will be deployed on major regional routes within Asia as well as on flights to Brisbane, Australia.